The Takamine LTD-1999 guitar marked a turning point where Bob and Takamine began to explore unorthodox approaches to guitar inlay (1999). The idea was proposed to expand the rosette design into the actual guitar soundhole. Takamine's headquarters stands in front of a mountain, (in Japanese, 'Takamine' means 'the mountain peak'). Bob's rosette design is actually based on photographs of this mountain, surrounded by inlaid clouds, a river and mountain peaks in the distance. The guitar top is laser-cut to include the mountain peak's intrusion into the soundhole. This unusual rosette includes rosewood, maple, mother of pearl and is beautifully surrounded in abalone. 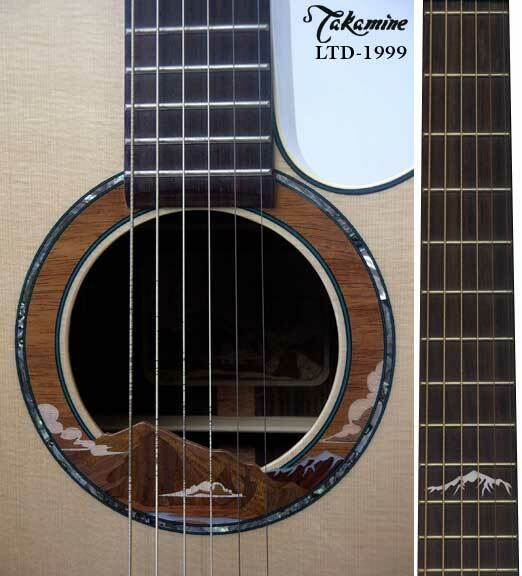 The fingerboard is simply marked with a snow-capped mountain inlay, marking the12th fret.